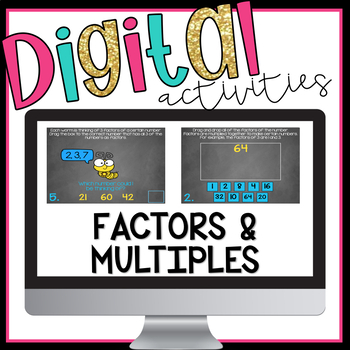 Factors and Multiples Digital Activities is a Digital Interactive Resource to be used with Google Slides. 4.OA.4: Find all factor pairs for a whole number in the range 1-100. 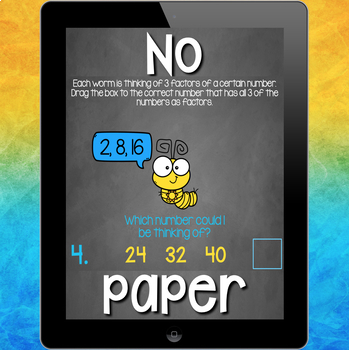 Recognize that a whole number is a multiple of each of its factors. Determine whether a given whole number in the range 1-100 is a multiple of a given one-digit number. Determine whether a given whole number in the range 1-100 is prime or composite. ⭐ Using drag and drop features to determine factors that belong to numbers. 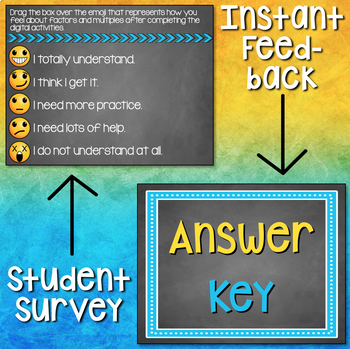 ⭐ Identifying numbers with specific factors. ⭐ Finding the first several multiples of numbers and common multiples between two numbers. 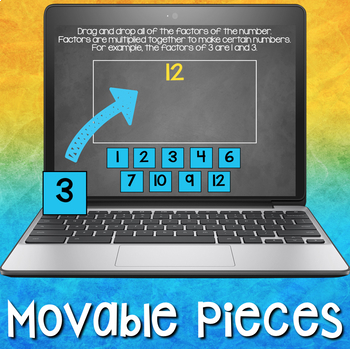 ⭐ Identifying numbers that are not multiples in an interactive way. ⭐Identifying and sorting prime and composite numbers according to their factors.